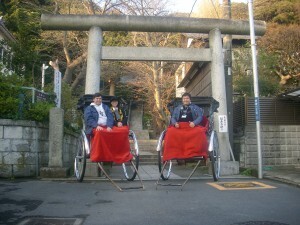 As written in part 3, we had left the elementary school in two rickshaws, and arrived at the next stop-off point; Yoshiya Nobuko Kinen-kan(/吉屋信子記念館, Yoshiya Nobuko Memorial Museum) http://guide.city.kamakura.kanagawa.jp/eng/stroll/scene/yoshiya.htm in the eastern area of Hase in Kamakura. Nobuko Yoshiya(/吉屋信子, 1896-1973) was a popular novelist, most of whose works are related to romance and adolescence of girls in the Taishiou and the Showa periods about 80-40 years ago. http://en.wikipedia.org/wiki/Nobuko_Yoshiya My mother liked some of Yoshiya’s works and read them in magazines for girls when she was young. Some of her works have been filmed or dramatized, such as “Ano Michi Kono Michi” (/あの道この道, this way ,that way) whose two TV drama versions are “Chikyoudai”(/乳姉妹, foster sisters) and “Fuyu no Rinbu”(/冬の輪舞, the Winter Rondo). I watched the two drama versions and kind of liked them. 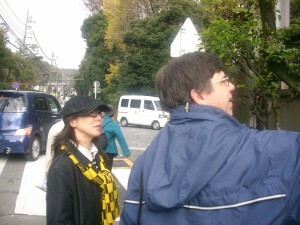 Anyway, we stopped in front of the museum which used to be Yoshiya’s residence. The long and white Japanese-style walls having black tile roofings were very sedate and chic. 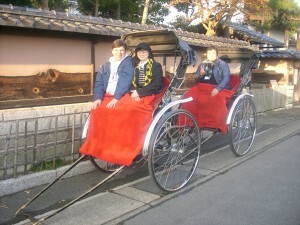 As there was no time for us, we didn’t enter the museum but just stayed for a while in front , listening to the guidance over Yoshiya by the rickshaw-pullers. Then, we went on to the next stop-off. 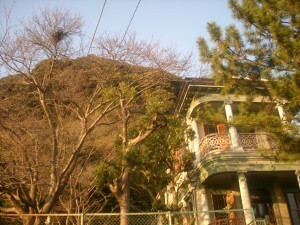 We stopped on the road where we were able to see the building of Kamakura Bungaku-kan(/鎌倉文学館, Kamakura Museum of Literature )http://kamakurabungaku.com/ on a green hill clearly yet in the distance. There, our rickshaw-pullers explained about the museum. 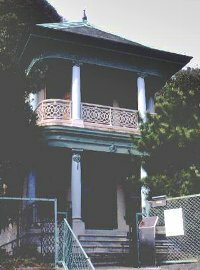 This building and land had been first built as a second house mansion of Marquis Toshitsugu Maeda in 1891 and was later donated to Kamakura City. This place including the building opened as Kamakura Museum of Literature in 1985. This facility supplies precious and interesting exhibits of items ,books, real manuscripts, pictures, and other data about well-known writers , poets, and other literal artists who lived or worked in Kamakura, such as Souseki Natsume(/夏目漱石), Jirou Osaragi(/大佛次郎), Yasunari Kawabata(/川端康成), and Ton Satomi(/里見弴), and Takeo Arishima(/有島武郎)　, all of whom have been famous and popular nationwide though they passed away many years ago. For example, Kawabata won the Nobel Prize for Literature in 1968. He produced some of works of Yasujirou Ozu（小津安二郎）, one most well-known Japanese film director, such as “Higanbana”(彼岸花, A Red Spider Lily) and “Akibiyori” (/秋日和, A Clear Autumn Day). http://en.wikipedia.org/wiki/Yasujir%C5%8D_Ozu Coincidentally, the two works of his were written by Satomi. 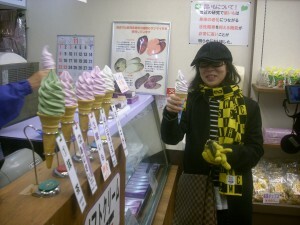 Kamakura once was a mecca of Japanese films mainly with Shochiku about from 75 ~ 40 years ago. 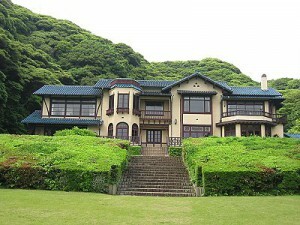 Usually people tend to think Kamakura is a historical area of a lot of old shrines, temples, and premodern- type buildings, which is quite true, yet we ought to recognize this area as a home to ample modern literal and film works of the golden ages of those aspects of modern culture of Japan as well. After my explanation with such some little- known anecdotes, we went on to the next stop-off . We passed by Hase Kodomo Kaikan(/長谷子ども会館, Hase Children’s Hall),which had been built as a second house mansion of a share-broker, Namizou Fukushima(福島浪蔵) in 1908 and sold to a rich　businessperson , Seiroku Moroto(/諸戸清六), and then was donated to Kamakura City in 1980. As we passed it by, our rickshaw- pullers kindly explained such a back story about the old fancy building which is now used as a children’ s hall with a playing ground. Then, we stopped in front of a white stone torii gate of Amanawa Shinmei Jinjya(/甘縄神明神社), the oldest Shinto shrine in Kamakura, and our pullers explained the back story about it. According to the pullers’ explanation, that one is the oldest shrine in Kamakura area and was built by Tarou Tokitada Someya(/染谷太郎時忠) , a chief of a local ruling family there in 710. 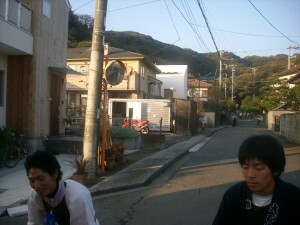 In those days this area of Hase faced the sea from which people there got and enjoyed a lot of seafood and stuff. Yet as there were such affluent items, people adhered to them and often caused troubles over the properties. 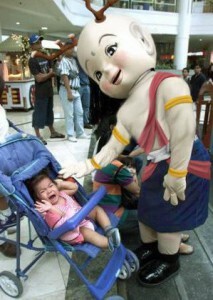 So, Someya built this shrine, wishing a merciful deity would come to stay at it and could bring peace to people there. And actually people made peace and lived happily since the completion of building the shrine according to a legend. The Japanese word ” Amanawa ” (甘縄) means “sweet”(甘) “rope” （縄) , but more than the superficial meaning of the Chinese characters, what is really important is the pronunciation of the word. The word “Amanawa” is from “Amanau ” which means “making peace in harmony” . Therefore the name of the shrine means ” a shrine for making peace with divine goodness” . 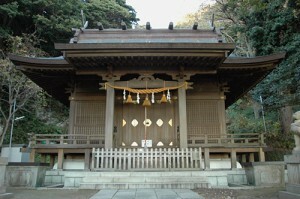 The deity enshrined at the shrine is Amaterasu Oomikami(/天照大神), the goddess of the sun, the supreme deity in the Japanese myth, and believed to be a great ancestor of the imperial family. And today, an old house in which Kawabata, who won the Nobel Prize as I mentioned, lived is still there, just next door of the shrine, which he described in his novel ” Yama no Oto”(/山の音, A Sound of the Mountain ). Fortunately, with our pullers guidance, we were able to see the house. Though I had visited the shrine a few times before, I didn’t know such interesting back story, so, I was impressed by it and our pullers’ explanation. The year 710 in which the shrine was built was also the very year that Heijyou-kyou（/平城京) , the first all-out and full-fledged capital of Japan with culturally advanced designs of the Chinese style was founded in by Empress Genmei(元明天皇, the 43rd emperor and the fifthempress of Japan). With that large and functional capital, Japan was able to open a new epoch of developing more refined culture and society than those in the previous days. The Heijyou-Kyou capital was replaced by the new capital of Nagaoka-kyou(/長岡京)　in 784 and Heian-kyou（/平安京） in 794 , but many people think Heijyou-kyou was the base of the old Japanese culture. That area is now Nara City (奈良市)　in Kansai（/関西, western area of Japan） and Heian-kyou now has become Kyoto. Both Nara and Kyoto are quite famous and popular tourists’ destinations with a lot of historical assets today, such as Houryuuji temple(/法隆寺） in Nara, the oldest existing wooden building in the world assumed to have been built in 607, and Kinkakujyi temple(/金閣寺, the Golden Pavillion） in Kyoto, and others. As Nara is older than Kyoto(the capital of Japan 794-1867) , some people prefer Nara to Kyoto and have intent to find out the archetype of the Japanese state. The term when Heijyou-kyou was the capital of Japan 710-784 is called ” the Nara Period”. 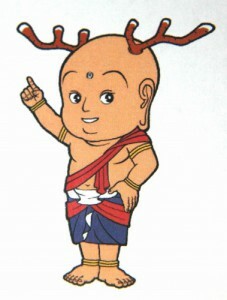 Actually the association has created an official imaginary character for the commemoration called “Sentokun” (/せんとくん)who looks like the great image of Buddha in Toudaiji temple (/東大寺) in Nara with a bit cartoonish image with two deer horns, for the tamed deer roaming freely in Nara Kouen(/奈良公園, Nara Park) are famous and believed to be familiar spirits of the deity enshrined at Kasuga-taisha(/春日大社, Kasuga Grand Shrine) which is located in the park. http://en.wikipedia.org/wiki/Kasuga-taisha The name of “Sentokun” is “sento”(a relocation of a capital) and “kun”(“master” or “sunny” for calling a young boy or a man), so Sentokun means “Master relocation of the capital ” to imply the foundation of the old Heijyou-kyou capital. Thus, though Amanawa Shinmei Jinjya is a kind of small and quiet shrine in Hase Kamakura, it holds a very long, old, and great history as just the same length of time of 1300 years (that is one millennium and three centuries !) 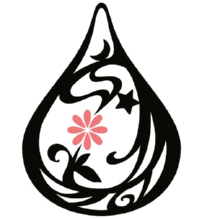 with the shiny history of the old capital of Nara or Heijou-kyou. 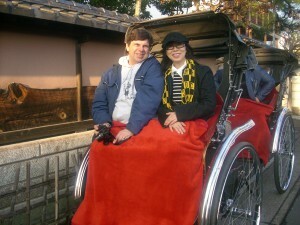 Considering that amazing fact, being filled with an exciting throb, we left the shrine for the final destination of our rickshaw tour.